After a long day of working, socializing, and taking care of business, there’s nothing you need more than a good 8 hours of sleep. Getting the right comforter for you can be difficult – some can be too hot, or too cold, too thick or too thin – you just want to find the right one for you. Luckily, we’ve got your back. We believe that comforters should feel like your protection against the cold world – yours should be a perfect match for you. Compared to microfiber down alternative comforters, down comforters are excellent for retaining heat in the winter, while at the same time giving you enough breathability for the summer months to avoid sweating and overheating. Best of all, down comforters, while plush and fluffy, don’t need to be cleaned and maintained very much. 2 What To Look Out For When Shopping for Down Comforters? Egyptian Bedding is one of the best names in bedding materials, including sheets, comforters, duvets, and pillows. 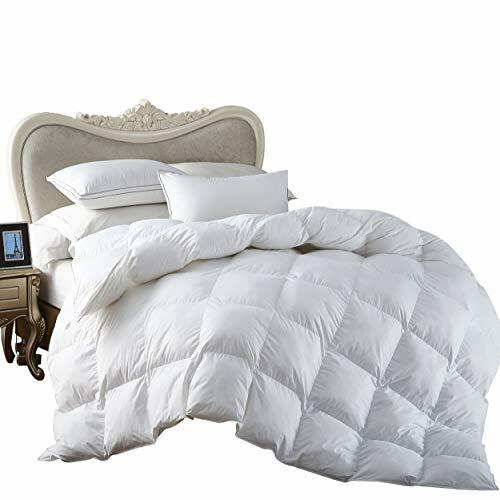 The 1200 Thread Count Siberian Goose Down Comforter is the crown jewel of the selection of comforters available from Egyptian Bedding. The 1200 Thread Count comforter, by far the most popular, is filled with 100% goose down and has a whopping 750 fill power. The 100% Egyptian cotton cover is wonderfully soft, and keeps the comforter entirely hypoallergenic. The fill of the comforter is expertly stitched in a baffle-box design, meaning that the goose down stays packed evenly and should keep you warm throughout the night. Customers have raved about the warmth, comfortability, and softness of the comforter. The quality and construction are particularly praised, as well as its general coziness. The Dobby Down Comforter, by Royal Hotel Bedding, is another elite comforter. Made with white duck down and still entirely hypoallergenic, it truly is an excellent choice for a thinner, yet still warm and plush comforter. In fact, one of the biggest standout qualities of the Dobby Down Comforter is how light-weight it is, despite the fact that it has a fill power of 650 – more than enough for a chilly night, and absolutely perfect for warmer climates. Though the comforter is very tightly packed upon arrival, customers have noted that, given a little bit of time, the comforter will fluff right up. The comforter is made in a box-designed fill packing, and has a 300 thread count – this unfortunately means that feathers could be a slight risk for you with this comforter. 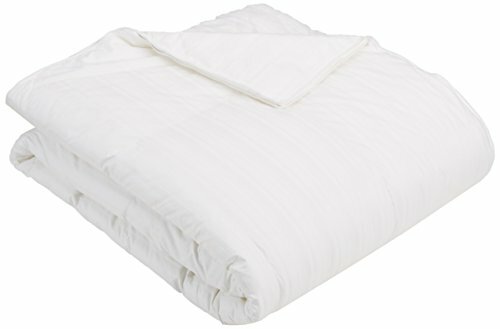 It is also an economical option for those looking for a high quality comforter. Pacific Coast is known for making excellent quality, durable bedding materials – this comforter is no exception. We loved the European Down Comforter, which is made with French Pyrenees goose down from the mountainous region of the same name. It has a thread count of 420, a fill power of 650, and is made with baffle box construction that prevents the down from collecting anywhere in the comforter. Despite its impressive fill power, you can expect to avoid overheating in the summer months, thanks to the great ventilation of the comforter. We find that one of the most impressive points to this comforter is its durability – it needs to be washed only once every 3-5 years, though we’d recommend a duvet cover just for cleanliness. Additionally, you can expect the comforter to last a good 10 years or more, according to customers. Customers have enjoyed, too, the fact that this comforter is slightly bigger than the average queen-sized comforter – an extra 8 inches. The All Seasons Comforter by Pure Down is another great choice for people looking for a cozy, lightweight option for springs, summers, and moderate winters. The comforter is filled with 75% duck down and is hypoallergenic. What we liked in particular about this comforter is the flexibility in size. Pure Down offers three different sizes – twin, queen, and king sized. It has a fill power of 600 and lets you avoid all kinds of mold, mildew, bacteria and dust mites. Furthermore, it has a special reinforcing pipe design on the edges to ensure that the whole length of the comforter stays toasty the whole night long. The only complaint that customers have mentioned about this comforter is that it is slightly less plush than comparable ones of its size. Of course, if you prefer lighter covers, that isn’t a problem in the slightest. The last comforter on our list is a special Down Alternative comforter, the Pinzon Hypoallergenic Goose Down Comforter, which has a custom-made polyester fill. It also has proprietary ‘PermaBaffle’ construction technology, which holds the polyester fill in place in much the same way that you’d expect from a typical down comforter. 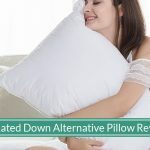 Another great advantage to the down alternative fill is the fact that it isn’t just entirely hypoallergenic, it’s also machine washable and dryable. The fill is comparable to 550 or 600 power. It’s a best-seller on Amazon, so it’s no surprise the customers have put in some excellent testimonials. One of the features that they rave about is one we haven’t even gone into yet – the ability to customize what warmth you want out of your comforter when you order. 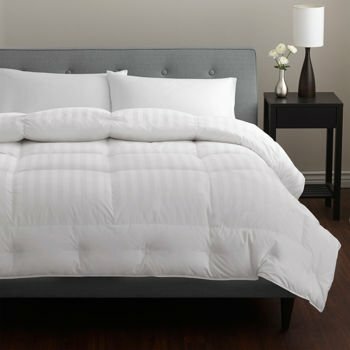 What To Look Out For When Shopping for Down Comforters? What kind of down do I want? There are three main kinds of down you can get in a comforter – duck down, goose down, and alternative down. Duck down is the most common kind of down. It’s comfortably fluffy and more often than not, very reasonably priced. Goose down is a little bit rarer. It is typically a little more fluffy than a duck down comforter, and insulates heat a little better. As you might have guessed, goose down comforters tend to come a little pricier than duck down ones. Finally, Down Alternative comforters are the most variable of available down comforters on the market. They’re commonly the most economical options, and can have a host of different benefits (i.e. hypoallergenic, special heat insulation qualities, etc.). Don’t forget that comforters may not always filled entirely with down – a portion of the comforter can also be feathers. The percentage of down in a comforter is definitely something you want to look out for. What is thread count? What is fill power? Why are they important for me? Thread count is the tightness in the weave of the fabric, usually cotton, that makes up the shell of the comforter. 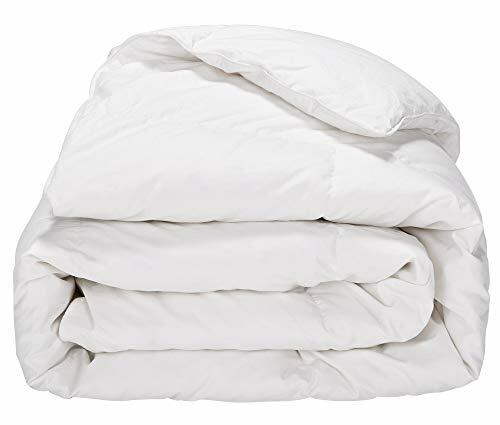 If you choose a down comforter with a thread count of over 200, you’ll be more than happy with the comforter – over 250 is an excellent quality comforter. If you start to head below a thread count of 180, you could be affected by allergies from the down and feathers on the inside. You also might see them slip through the comforter slightly, especially with continued use. Fill power just answers the question: “How good is the down in this comforter, really?” The fill power of a down comforter depends on how much heat the down can insulate and retain. Typically, 450-500 is an average fill power, 500-700 is above average, and 700+ is awesome fill power. Cleaning a down comforter can be a challenging affair – it’s generally best to use a special cleaning solution to make sure that you avoid not only damaging the down within the comforter, but also that you don’t have a lumpy and shrunken comforter after a wash. The best option is to go to a dry cleaner, because they usually have a commercial front-loaded washing machine that can most easily clean the comforter without distorting it. Normal home washing machines cannot be used to wash down comforters. If you do have a front-loaded washing machine, or access to one, make sure that the down comforter is washed on lukewarm, delicate, and preferably with an extra rinse cycle to push as much water as possible from the comforter. If you throw in a pair of clean white socks with a couple tennis balls stuffed inside, this can also help keep the comforter lump-less after a wash. Picking the right down comforter can be a challenging task. We found the five comforters above to be a good selection of duck, goose, and alternative down comforters. 1200 thread count that provides a soft cover for the plush, fluffy comforter. The goose down will keep you warm in all seasons, and you’ll appreciate both the 750+ fill power and the 50oz of down inside. The 1200 thread count keeps the down firmly in the comforter, and ensures that it stays hypoallergenic, despite any wear and tear. Though we’d recommend you dry clean the comforter, the durability of the comforter is good enough that you’ll only have to worry about that once a couple years. Customers can’t express their pleasure at having the Egyptian Bedding 1200 TC Comforter enough. 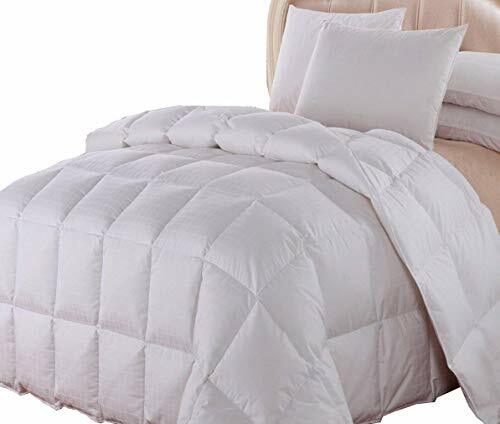 We love the Egyptian Bedding 1200 Thread Count Siberian Goose Down Comforter, and it’s our choice as the best down comforter available today.